We've added two magazines to our Title Spotlight section this week, but apart from their physical sizes and the fact that there are comics inside, they don't have a thing in common but the staples. Warren Publishing released the first issue of Vampirella in 1969. Like its sister publications, Creepy and Eerie, it was a black-and-white horror anthology aimed at an older audience. Unlike Uncle Creepy and Cousin Eerie, Vampirella usually starred in the main story of each issue as well as hosted the other features. Sales figures for the magazine weren't published until 1974, but for six of the nine years in which Warren published circulation statements, Vampirella's average paid circulation stayed above 90,000 copies per issue. In its final three years, sales dropped steadily each year. However, looking at the sell-through numbers, the title consistently stayed above 55% throughout, much better than the "print three to sell one" newsstand model of the time for comics. Warren's Vampirella lasted for 112 issues, ending shortly before the company declared bankruptcy. Harris Publications acquired the company's assets and later published Vampirella #113, reprinting earlier stories, as well as a number of Vampirella comics series and mini-series. Dynamite Entertainment acquired the rights to Vampirella earlier this year and has announced plans to release hard- and softcover collections of both the Warren and Harris materials. 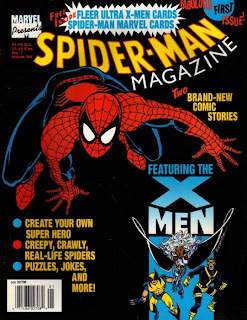 Moving into the 1990s, Marvel's Spider-Man Magazine came out of the company's partnership with and eventual acquisition of children's publisher Welsh Publishing. 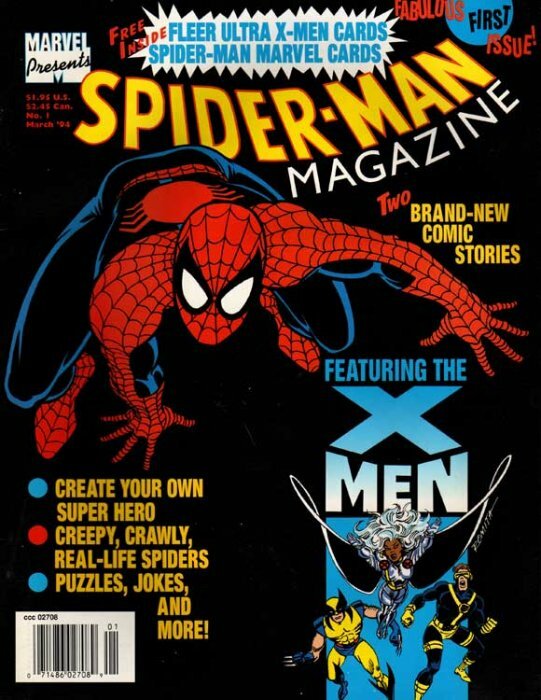 The magazine was aimed at younger readers and contained, in addition to comics stories featuring Spider-Man and the X-Men, a variety of other features, including jokes and puzzles. Other titles, inlcuding one combining National Football League coverage and comics, came out of the Welsh partnership. The sole circulation statement for the short-lived series (only about 10 issues made it to the newsstand) would have been released before much sales data could have been accumulated, but the numbers it shows are troubling, particularly the sell-through figure of 24.9%. Since Spider-Man Magazine wouldn't have had much of any sales through the Direct Market comics shops, whatever the newsstand sales were would be about all it had. Flashback Friday: NYT on "Heroes Reborn"